LET’S DO THIS, BROOKLYN! Join Sarah for a weekend of self-love, empowerment, authentic badassery, and all the fun you’ve come to know and (and, hopefully) love from her social media. LIFELOVE is the greatest self-love party ever created! * Over the course of a weekend, you’ll connect to self, find community with others, and learn tools to create change all within a supportive and loving environment surrounded by body-inclusive attendees who, just like you, are ready to experience MORE in life. *Don’t take our word for it – ask Sarah’s mom! Early Bird tickets go on sale Saturday, April 13 at 9 am PT! Have you been holding back? Maybe being a parent has made you wonder where “you” have gone? Or you’ve become “all work and no play?” Maybe you feel trapped in your body or like you simply never felt comfy in your own skin? It’s time to connect to yourself as you TRULY are. LIFELOVE will help you tap into your authentic and vulnerable self so that you can show up fully empowered with who you are AS you are in your daily life. At some point in time, we all feel alone. Many of us feel “broken” or like nobody can understand what it feels like to struggle. Not here. At LIFLOVE, we bond together with common hopes and fears. Come as you are and leave with new friends that feel like old ones! We are EVERY size and shape and age. You’ll laugh. You’ll cry. If hugging is your thing, you’ll find that too. There is something truly powerful about a shared experience with over 150 people who are just like you; The group energy at LIFELOVE is badass. You WILL leave LIFELOVE with a renewed sense of self and armed with practical tools you can start using every day to create change in your life. This is not about becoming a NEW person but a greater version of the you that you already are. At LIFELOVE you are imperfectly perfect, flawed and beautiful. This is not a “popularity contest,” and we all take care of each other. Also, our mental health partner is on-site with our “Low Sensory Space” to assist if you need it. We are around to offer support, a hug, or tissues if you need that too. When was the last time that you went somewhere and felt like everyone was on your side and rooting for you to feel awesome? Don’t know what LIFELOVE is about? BROOKLYN’S IN THE HOUSE! For our first year, we were in a private house nestled in the Hollywood Hills. Last year, we shacked up in Viva Las Vegas, baby. This year, we’re coming to the Big Apple to Sarah’s hometown of Brooklyn, NY! Our venue is located in the Red Hook area of Brooklyn. The space is a super cool and renovated industrial space that was originally built in 1854. With bright, open rooms, skylights, and plenty of natural light, we are super excited to be able to call The Hamilton our home for the weekend. To learn more about Red Hook, you can visit this (unaffiliated) website here. Several airports are accessible to the NY-area including JFK International Airport and LaGuardia International Airport. NYC is also train and car accessible. The venue is not subway-friendly; we suggest taking a ride share (like Lyft or Uber) or catching the NY Ferry on the South Brooklyn line. There is street parking available in the neighborhood. Select your main event ticket. Are you buying an Early Bird, General, Lots of Love, or Last Minute ticket? Pick your add-ons! There are TWO optional experiences to add on to the main event; our Friday night mixer and Sunday meditation. Each add-on is $50 if you get both, you can bundle them together and save and get the pair for $89! Or you can pass on both! It’s totally up to you. Decide if you want to pre-order your event tee. Each year, everyone asks for a workshop tee shirt. Due to production constraints, it’s not possible for Sarah to have a large selection of tees in different sizes on-site. Order your workshop tee in advance, and we’ll make sure it’s waiting for you on Sunday to take home with you! Add-ons are available INSIDE the shopping cart one you select your ticket. That’s it! It’s as easy as 1-2-3. We’re kicking off the weekend with a big party! This is the perfect chance to connect with other attendees and hang with Sarah. 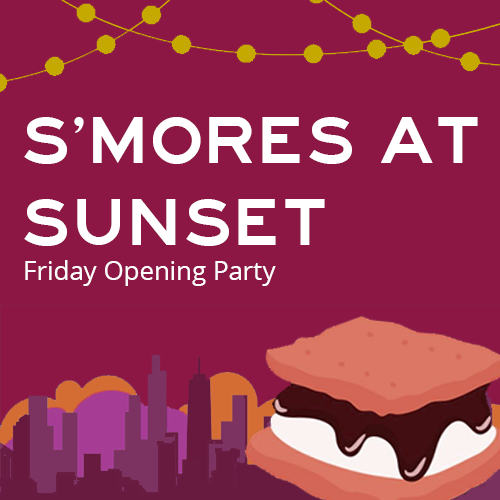 Make a s’more at one of our outdoor fire pits, join along a Karaoke jam session, and enjoy an (adult) beverage while kicking back. Early morning mediation has your name on it! Join in as Sarah leads Sunday Sadhana to help you center, release pain, and feel peacefully full. Sarah will explain the basics of meditation and help you understand how a daily practice can be an emotional life saver. Every year, attendees ASK for event tees! Sarah insists on having tees available in sizes small - 4X AND that they not be too expensive. Order yours in advance, and we’ll make sure it’s waiting for you to take home. The tee will be a black or dark grey, woman’s scoop-neck tee with logo. By purchasing a ticket to LIFELOVE, every attendee agrees to adhere to the event code of conduct, refund policy, and liability policy. Wondering where to stay for LIFELOVE? We can help! Option 1: Join us at the Fairfield Inn & Suites in Brooklyn. The Fairfield Inn & Suits, located at 181 3rd Ave, Brooklyn, NY 11217, is approximately 1.6 miles away from our venue. Each room comes with complimentary breakfast in the morning. Book your room by August 1st to take advantage of our group rate. You must use the link here to book your room or else you will not get access to our group rate. Looking for an alternative option? Seek and ye shall find! Don’t forget you are a quick NYC Ferry ride directly from Wall Street to the Redhook stop in Brooklyn. Click here to learn more. PS - We had Sarah’s mom ride the ferry to make sure it was comfy, safe, and a good option… MOM APPROVED! Have a question? Here are answers to some of the most common questions we get. If you still need assistance, email us at TeamSarah@DevelopedNarrative.com. LIFELOVE is taking place this year at The Hamilton. 120 Hamilton Ave, Brooklyn, NY 11231. Tickets for LIFELOVE range from $399 to $1,000. We have a limited number of need-based scholarships available. More information about this will be shared soon. If you want to know yourself better and love yourself more, LIFELOVE is for you. If you want to connect to yourself and learn HOW to create real change in your life, you’ll fit right in. If you are on a body journey or find yourself wanting MORE from life, you’ve found a home. LIFELOVE is for persons of EVERY age and size and shape. Our event will take place in the Red Hook area of Brooklyn in a very cool converted, industrial-style warehouse space. Red Hook is considered “south” Brooklyn. Many people who think of New York City think of Manhattan; Brooklyn is another borough in NYC, as is Manhattan. If you decide to stay in Lower Manhattan (like the Wall Street area) we suggest taking the ferry. (See below) If you decide to stay in Brooklyn, we suggest taking a rideshare like Lyft or Uber. Stay where your budget best fits! We have a small room block at a Brooklyn hotel; that being said, you may wish to find more cost-effective accommodations. LIFELOVE wraps by 5 pm on Sunday. We suggest finding a flight after 8 or 9 pm to assure adequate travel time to the airport. There is parking on the street in the neighborhood around the event space. We suggest taking a ride share like Lyft or Uber. We do NOT suggest walking to the venue from your hotel. BE COMFORTABLE! Be comfy and dress in layers. We suggest wearing leggings or some kind of athletic/athleisurewear for Saturday to be comfortable for Kundalini class. If you plan on being part of Sunday Meditation, we suggest the same. Bring a sweater or sweatshirt and be prepared with layers. Unfortunately, your ticket is non-refundable. You can, however, transfer the ticket to another person. Email TeamSarah@DevelopedNarrative.com to transfer your ticket. Learn more about our policy here. Yes! There are no stairs inside or outside the venue. There is a handicapped accessible bathroom. We take every effort to assure you are comfortable. We will have a "low sensory" space and a counselor on-site for any who need it. It means that we take every effort to make sure that persons of every size feel safe and comfortable. For example, the chairs we use are armless and sturdy; we will offer floor seating as well for those who are more comfortable camped out in the floor. LIFELOVE is best experienced in its entirety, from start to finish. If you have to sneak out early, we totally get it. We'll still totally miss you, though. No! Sarah has lost weight because she needed to do so for her health and mobility. This event does not push "diet culture" as a means to creating happiness. Instead, it will encourage you to find out what a greater life means to you! 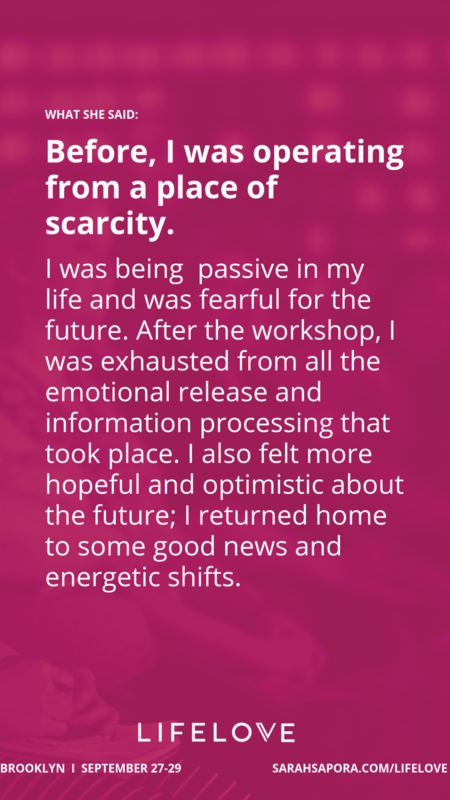 The workshop shares the tools that Sarah has used to create her greater life, focusing on changes fueled by self-love. Kundalini yoga is awesome! No, really. Kundalini yoga, known as the "Mother yoga" is a form of yoga that combines meditation, breathing, and movement. It is VERY body-friendly! We totally understand that something new, like Kundalini, can be intimidating. Keep an open mind and heart and dive in! Yoga Journal describes Kundalini as "An uplifting blend of spiritual and physical practices, Kundalini Yoga incorporates movement, dynamic breathing techniques, meditation, and the chanting of mantras, such as Sat Nam, meaning 'truth is my identity.' The goal is to build physical vitality and increase consciousness." Speakers and panelists at LIFELOVE will be announced soon! 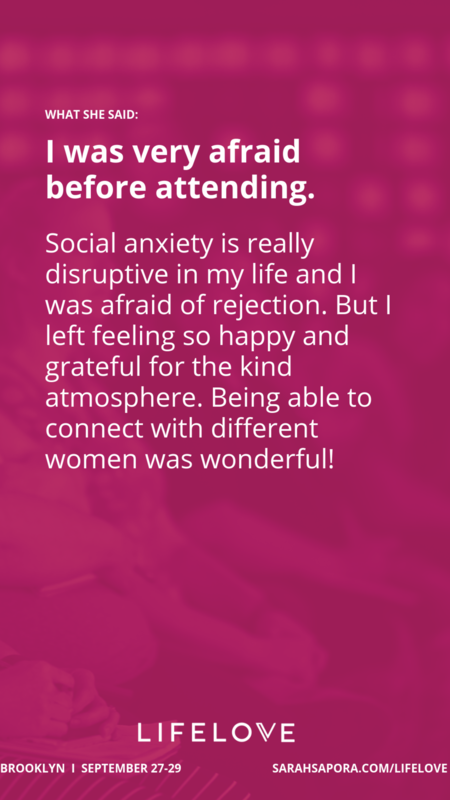 Hear directly from women who attended the workshop experience last year!